Canadian sports car racing icon Ron Fellows will join the Indy Legends Pro-Am field June 16 during the Brickyard Vintage Racing Invitational at the Indianapolis Motor Speedway. Fellows will compete as a second promoter’s option, with Brickyard 400 winner Bill Elliott and Brickyard 400-winning crew chief Ray Evernham paired as the first promoter’s option. Fellows built an exceptional career in auto racing at the wheel and on the business side. He is one of Trans Am’s most prolific winners with 20 overall victories. Since his driving career started in the early 80s, some of his major accomplishments include 25 American Le Mans Series wins from 2000 through 2006, when he also won three consecutive GTS class driver’s championships. Fellows was the overall winner in the 24 Hours of Daytona in 2001 and brought home two first-place GTS class trophies at the 24 Hours of Le Mans, in 2001 and 2002. Ontario native Fellows also enjoyed success in NASCAR as a road course specialist. He won four Xfinity Series races and recorded eight other top-five finishes. He won two Camping World Truck Series races and also finished runner-up twice in the Cup Series. Fellows began to wind down his driving career in 2008 but returned in 2010 with the assistance of business executive Dave Roberts, who will share his 1969 Camaro with him in the Pro-Am. Fellows returned to compete in three SCCA World Challenge GT races, winning two of them. His most recent Trans Am appearance was a one-off ride in 2014 at Canadian Tire Motorsport Park (Mosport), where he shocked the field by scoring an overall win after an 18-year absence. Other top names who will line up at the famous Yard of Bricks include Al Unser Jr., Paul Tracy, Willy T. Ribbs, Geoff Brabham, and Davey Hamilton. Sarah Fisher, the defending champion of the A Production class, and Max Papis, who won B Production last year, are also looking to repeat as victors. The Indy Legends Pro-Am is the Saturday feature event of the Brickyard Vintage Racing Invitational, a Sportscar Vintage Racing Association (SVRA) event. Professional drivers will be in 1963 to 1972 vintage Corvettes, Camaros and Mustangs of SVRA “Group 6” A and B Production. They will be paired with amateur drivers, splitting their stints at the wheel. Additional Indy 500 drivers will be announced as they enter in the coming weeks. In addition to the Pro-Am, there will be a festival of other activities at the Brickyard Invitational, including the Sunday, June 17 feature race by the professional Trans Am series headed by 2017 champion Ernie Francis Jr. The weekend also presents the Hagerty Insurance “shine and show” car corral, vintage motorcycle racing, and 500-plus vintage racers ranging over 100 years of automotive history racing in SVRA Groups 1 through 12. An oval exhibition featuring a race car show of judged competition for the A.J. Watson and Sir Jack Brabham trophies led by track historian Donald Davidson will also take place. Also, the Pre-1920 Race Exhibition cars will be on track along with a paddock area full of in-period equipment displays. The National that finished seventh in the first Indianapolis 500 in 1911 will be driven at speed. 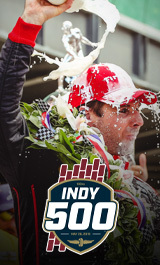 Visit IMS.com to buy tickets or for more information on the Brickyard Vintage Racing Invitational. All fans 15 and younger will be admitted free when accompanied by an adult ticket holder during this Father’s Day weekend event.